The King Faisal Specialist Hospital and Research Centre (KFSH&RC) is as an IAEA Collaborating Centre working to support the implementation of selected programmatic activities in radiation medicine, focusing particularly on medical radiation physics aspects of radiation medicine. 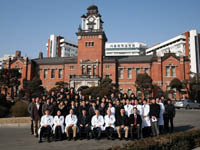 Since 1990, KINS has acquired a positive reputation in the field of environmental radionuclide analysis and has collaborated with the IAEA on many occasions, including conducting interlaboratory exercises for in-situ gamma-spectrometry and proficiency tests in which members of the Asia-Pacific ALMERA regional group paricipate. 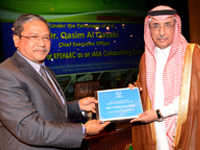 In November 2006, KINS was nominated as the focal point laboratory for the Asia-Pacific regional ALMERA network and organizes annual meetings for the purpose of exchanging key information with the IAEA and its other members. The SJRI has been working with the IAEA’s Nutrition and Health-Related Environmental Studies Section since 1988, with a focus on nutrition as well as infectious and life-style related diseases. 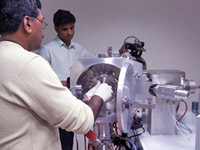 As an official IAEA collaborating centre, the SJRI analyses samples for Asian and African Member States, provides lectures for the IAEA’s courses on table isotope techniques, and trains research fellows from Member States worldwide. In 2010 ANSTO, Australia, with its state-of-the-art neutron-beam facilities associated with the OPAL Research Reactor, for the 2nd time in a row was re-designated as an IAEA Collaborating Centre (IAEA-CC) for Neutron Scattering Applications. This re-designation will enable access and help build skills in the region through a variety of mechanisms, including normal IAEA channels, contributing to expected improvements in the fields of engineering, health and nutrition, and environment. ANSTO constantly provides assistance to the IAEA’s training and education programmes for the neutron user community, organizes thematic workshops and schools offers their experts within TC and RB activities. 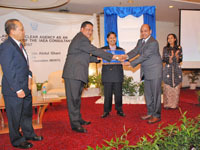 The Malaysian Nuclear Agency has been closely collaborating with the IAEA since the early 1970’s and has been the counterpart for four IAEA technical cooperation projects for 16 consecutive years. During its first years as an official IAEA collaborating centre, the Malaysian Nuclear Agency developed various products for industrial, environmental, and healthcare applications. Many of the research projects implemented in collaboration with the IAEA are now being scaled-up to the pilot plant production trail and market acceptance tests. The Atomic Energy Commission of Syria (AECS) is an IAEA collaborating centre in the field of Characterization of Reference Materials and Radioecology of Naturally Occurring Radioactive Materials. The AECS is also the Middle East regional coordinator of the IAEA ALMERA network (Analytical Laboratories for the Measurement of Environmental Radioactivity). In collaboration with the IAEA, the National Institute of Radiological Sciences (NIRS) promotes studies of low-dose radiation effects, which has been one of the institute’s primary research areas since its foundation. NIRS contributes to progress and development in this important field, as well as others, in close contact with organizations at the national, regional, and international levels. The Philippine Nuclear Research Institute (PNRI), which is the only IAEA collaborating Centre on Harmful Algal Blooms (HABs) in the world, undertakes research jointly with the IAEA Environment laboratories in Monaco to track the impacts and fate of biotoxins in the marine food-chain using radiolabeled analogues. Recently, PNRI undertook studies in Manila Bay to assess the transfer of Paralytic Shellfish Poisoning toxins from harmful algae to green mussels farmed in that area. Since its nomination as an IAEA collaborating centre in 2004, the Department of Nuclear Medicine at Seoul National University has acted as a hub of international education and research in nuclear medicine and related sciences. Through their collaboration, communication and training they have facilitated studies and practices with the objective of establishing effective use of molecular imaging using PET and in vitro molecular techniques in the management of oncological and cardiovascular disorders.